I think one of the reasons that Thomas agrees to watch cooking shows with me is that it often inspires me to make something from the episode the next day. Last night I finally got around to watching Ina’s new episode of Barefoot Contessa where she is on “vacation” in Napa. However, both her and Jeffrey are working on this vacation. 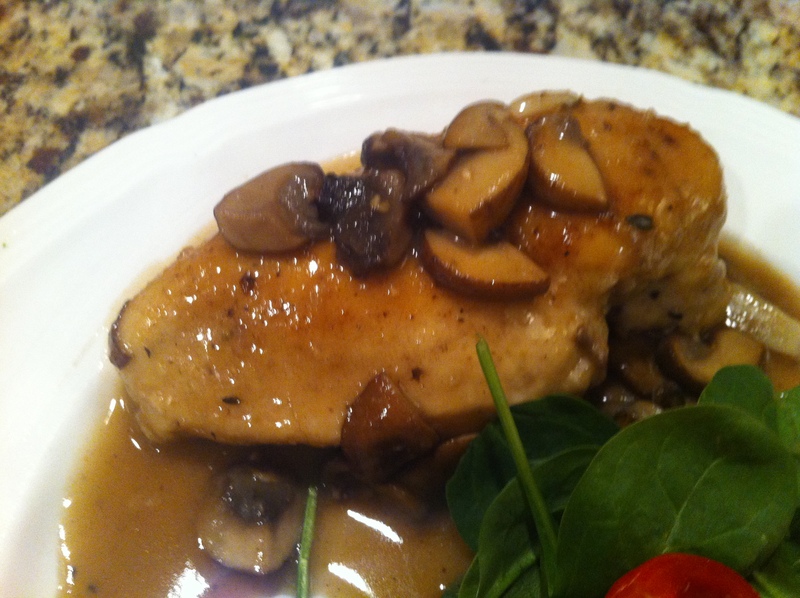 She made chicken with wild mushroom sauce and it just looked wonderful, so I made it. I made a few tweaks though–I wanted the ease of just using chicken breast (and the portion control, with only 2 of us it doesn’t makes sense to cook 2 whole chickens). This dish is simply divine–and don’t skip on the garlic! It may seem redundant to add whole cloves and then minced, but the whole cloves roast a little and add a real depth to the sauce. Plus, they make a perfect spreadable addition to bread. 1 pint baby bella mushrooms, stems removed and cubed. 1 big clove of garlic, minced. 1. Preheat the oven to 325. Pat the chicken dry and season liberally with salt and pepper on all sides. Then dredge chicken in flour. 5. Add the chicken back to the pot and nestle it down in the mushroom mixture. Cover and bake in oven for 25 minutes. 6. Place pot back on stovetop and remove chicken and discard thyme stems. While the sauce is simmering on low heat, stir in the butter and flour mixture. Continue cooking, stirring often until the sauce thickens. Taste the sauce and add salt and pepper if needed. I SAW THIS EPISODE THE OTHER DAY!!! looked so good but a lot of take out of the pot put it back and i dont have a nice ceramic pot like that that can go from stove top to oven. This recipe does have a lot of moving parts, and the pot is necessary. The taste of it in the end makes it all worth it though! Maybe I’ll make it for you next time you visit!